Hard to believe it’s been over a year since I took my fragile self off to the hospital for them to scan my small bowel. Hard to believe that this year is already flying by and I’m already 7 weeks into my steroid course and due for a follow up next week. But, first things first, I must get my belly scanned. I must, I must, I MUST. 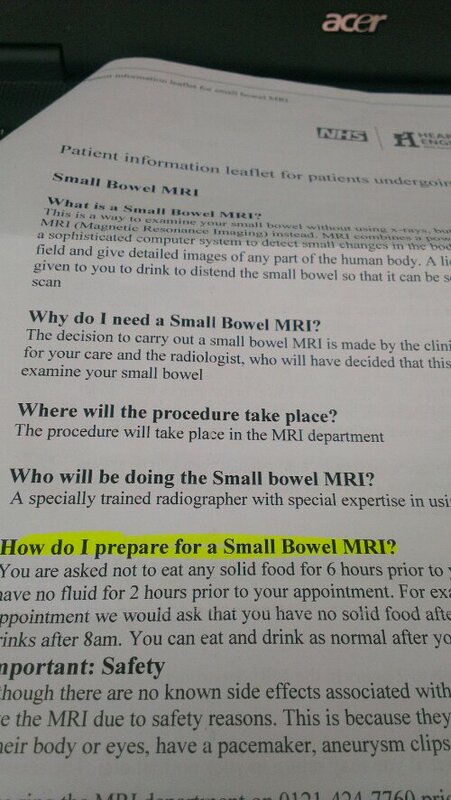 It was a pre requisite for getting to see my consultant in April, a small bowel MRI study. It is also the precursor that will eliminate or accept certain treatment plans for my Crohn’s. So, what exactly is a MRI scan? What are they looking for? How is it done? How does one prepare for it? Unfortunately (or fortunately, depending on your outlook on scopes) a MRI scan is the only way the small bowel can be imaged and examined. It is also the most clearest; a CT scan for example won’t provide nearly as much detail as a MRI can to our hardworking GIs, consultants and nurses. This is because the camera attached to a flexi sigmodoscopy or indeed a colonoscopy is limited to just that, your colon, and cannot travel further into your digestive tract from the back entrance. Also, an upper GI endoscopy procedure will not be able to reach the small bowel either. And without exploring you surgically, a MRI provides the best and most current data of your internal condition. It seems that a MRI is the last on the check list for Crohn’s disease. I had to pretty much beg my GI to consent to a MRI because it is still considered “expensive and timely”. Admittedly, yes, it might be, but after my successful colonoscopy not 3 months ago and now these quite significant symptoms, this is now necessary. To prepare for this, it is nothing like cleaning out for a scope. All I have to do is be nil by mouth for 6 hours before the procedure and no fluids for 2 hours before, also. So for my appointment, my last meal will either be a late dinner tomorrow, or a very early (before 7am) breakfast on Thursday. For me, however, I am trying a more liquid and safe diet this week (after a bad weekend of gut ache and general Crohn’s unwellness, completely separate issue, somewhat) so my eating habits change tonight. This just helps me ease into the vast amount of liquid I have to take before the procedure. Oh yes, the Kleanprep. Like a colonoscopy, I have some prep to do before being allowed into the machine to be scanned. I have to drink a litre of bowel prep over a 45 minute period (that’s one cup every 8 minutes!) before being cannulised and taken for the scan. Then the contrast dye and bowel fluorescing begins. It’s about a 40 minute scan which is quite nice, if I remember correctly. The machine is well vetilated and you get ear protected from the constant drumming noise, I found it all quite relaxing last time around. The aftermath of it, not so much. Kleanprep in itself is a “mild laxative” which makes travelling home afterwards more of an adventure. For me, I’m going in to investigate these damn polyps that were found on my colonoscopy. Since the scope in December I’ve subsequently come off my Humira treatment plan and after a month of nothing for my Crohn’s, put back on a course of steroids. They have left me feeling moonfaced, overweight and generally frustrated with the hot sweats, chronic insomnia and mild depression. Meanwhile, there is a constant party in my guts; which has a distinct lack of senstitivity about distrupting my life. So I would like to come off Pred (pretty please, with a cherry on top!) but still have at least the next three weeks to combat them. Hopefully, this scan can give some concrete evidence to suggest what is next. It is a hurdle. It is a hoop I must jump through to get to the next stage – which could very well be Infliximab or similar – and progress to treat these newer symptoms and manage the older ones. One can hardly wait for Thursday to arrive! I will be live tweeting and doing a detailed blog post after the event, so if you have any questions or queries about a small bowel MRI scan, don’t hesitate to comment! Previous Post It’s finally time..
I’m not sure how I found your blog but here I am. Good luck with your MRI and with any treatment the doc sets you up with. Been there and I know it’s not fun.